The slow, steady intertwining of Chrome OS and Android continues to create beneficial and worthwhile changes for our beloved OS. From material design elements to split-screen tablet functions, Chrome OS has definitely benefitted from the slowly evolving partnership. Chrome’s adoption of Android’s more-refined parts is slowly turning the OS into a more visually cohesive whole while adding features people expect from convertibles and tablets alike. Today’s addition falls right into that line. Lock screen notifications. For anyone who’s used a smartphone in the past 7 years, you know what this is all about. From your lock screen, especially with phones and tablets, you expect to see your notifications at a glance. Android is probably the best at this, and all notifications as well. Over the years, Google has continued to refine and build on what has become the best notification center in any operating system anywhere. Even my iOS buddies envy my Pixel 2 XL’s fantastic notification handling. While we’ve seen some work done to make Chrome OS’ notifications more like Android, there are still some missing parts. One of those missing features is any sort of lock screen presence. 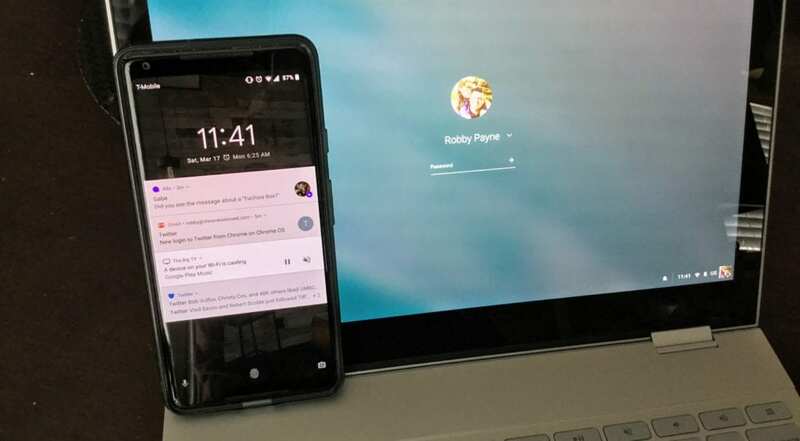 From the looks of this commit (found by XDA), it appears we’re getting close to seeing some notification action on our Chromebook lock screens. Though still in testing, this change is clearly being prepped for the imminent arrival of detachable Chromebooks and Chrome OS tablets likely coming in Q3 of 2018. We’ve seen Acer’s Chrome OS tablet break cover already, but we’re waiting for the floodgates to fully open later this year. We’re tracking all sorts of detachable Chromebooks at the moment, so as the year progresses, we’ll continue seeing tablet-focused tweaks showing up. The idea of being able to interact with notifications on my lock screen with a Chrome OS tablet is really, really enticing. 2018 is going to be a fun year for Chromies old and new alike.